The Series 90 30 Genius Communications Module (IC693CMM301) is an intelligent module that provides automatic, global data communications between a Series 90-30 PLC and up to 7 other devices on a Genius bus. Global Data is data that is transmitted automatically and repeatedly, allowing the formation of a shared database. A Genius Communications Module can exchange up to a total of 256 bits (32 bytes) of Global Data. Series 90-30 Series 90 70 Bus Controller Series 90-30 HHP GCM Computer Used for Programming and Configuration Genius Bus PCIM Computer Used for Data Monitoring The illustration above represents a Series 90-30 PLC with a Genius Communications Module that can exchange Global Data with a Series 90-70 PLC and a computer equipped with a PCIM card. The diagram also shows a Hand-held Programmer and a computer, both of which can be used to configure the Series 90-30 PLC and GCM. The GCM can monitor input data from I/O devices; however, it cannot control I/O devices. Other Genius Options for the Series 90-30 PLC There are two other Genius modules for the Series 90-30 PLC: The Enhanced Genius Communications Module (GCM+). The GCM+ can exchange up to 128 bytes of Global Data with up to 30 other devices on the bus. The GCM+ provides diagnostics information and can potentially operate without a host PLC program. The GCM+ module cannot be installed in the same Series 90-30 PLC as a GCM module. See appendix B for a comparison of the features of the GCM and GCM+. The Series 90-30 Genius Bus Controller. The Bus Controller can exchange up to 128 bytes of Global Data and/or I/O control data. It can be used to interface the Series 90-30 PLC to Genius I/O Blocks, Remote Drops, and Field Control I/O Stations, as well as other types of controllers. A Bus Controller cannot be installed in the sameRemote Racks: Genius Communications Modules that are version IC697CMM301F/304F or later can be located in a remote rack. Earlier module versions can be upgraded for this purpose using Upgrade Kit: 44A286397-G03. PLC CPU: Genius Communications Modules that are version IC697CMM301E/304E or earlier are not compatible with PLC CPU models: IC693CPU311H, -321H, and -331J or later. They can be upgraded using Upgrade Kit: 44A286397-G03. This module is compatible with any Bus Controller, PCIM, or QBIM on the bus, except Series Six Bus Controller models IC66*CBB900, -901, -902E or earlier, or -903E or earlier. The GCM cannot be installed in the same Series 90-30 PLC as a Series 90-30 Genius Bus Controller. The GCM cannot be installed in the same Series 90-30 PLC as an Enhanced Genius Communications Module (GCM+). A Genius Hand held Monitor can be used to display: the GCM Bus Address, its software version, and the Series Six register address configured for global data. HHM version IC660HHM501H (rev. 4.5) or later is required. There is no Hand held Monitor connector on the GCM module, but a Hand held Monitor may communicate with the GCM while connected to any other device on the bus. Optionally, an additional HHM mating connector can be installed on the bus near the GCM. Genius I/O blocks may be present on the same bus. However, the GCM is not compatible with older phase A blocks; they should not be installed on the same bus. 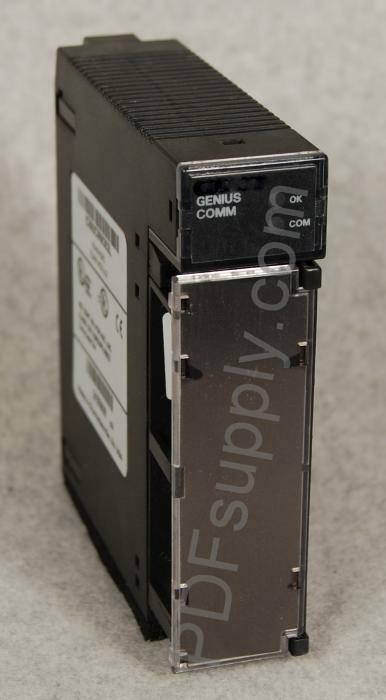 Series 90 30 PLC Bus Controllers Enhanced Genius Communications Module (GCM+) Genius Hand held Monitor Genius I/O Blocks 2 section level 1 figure bi level 1 table_big level 1 GFK-0412B 2-1 Chapter 2 Hardware Installation This chapter explains how to: install and remove a Genius Communications Module remove and install the module s Terminal Assembly select and install the Bus Cable connect and terminate the communications bus plan system wiring installation and protect against lightning surges install a separate Genius Hand-held Monitor connector on the bus Module Installation and Removal The Genius Communications Module may be installed and removed in the same manner as all other Series 90-30 modules. Power must be OFF when installing or removing the module. Module Installation To install the Genius Communications Module in the Series 90-30 PLC backplate: 1. Grasp the module with the terminal board toward you and the rear hook facing away from you. 2. Align the module with the desired base slot and connector. Tilt the module upward so that the top rear hook on the module engages the slot on the baseplate. 3. Swing the module downward until the connectors mate and the locking lever on the bottom of the module snaps into place, engaging the baseplate notch. Note the slot number; this number must be entered when the module is configured. 2 2-2 Series 90 -30 Genius Communications Module User s Manual August 1997 GFK-0412B Module Removal The module can be removed without powering down the communications bus, provided the incoming and outgoing Serial 1 wires have been connected to one terminal and the Serial 2 wires have been connected to one terminal. If this has been done, do not disconnect the bus cable or any terminating resistor. Remove the Terminal Assembly from the front of the Genius Communications Module carefully. Avoid contact with exposed cable wiring. Place the Terminal Assembly, with the bus wiring still attached, in a protected location. Caution If exposed wiring comes in contact with conductive material, data on the bus may be corrupted, possibly causing the system to shut down. If the rest of the bus is powered down, the bus wiring can be removed from the module. To remove the module: 1. Locate the release lever on the bottom of the module. Firmly press it up toward the module. 2. While holding the module firmly at the top, continue fully depressing the release lever and swing the module upward. 3. Disengage the hook at the top of the module by raising the module up and moving it away from the baseplate. a43056 PRESS RELEASE LEVER 2 GFK-0412B Chapter 2 Hardware Installation 2-3 Terminal Assembly Removal and Installation The Terminal Assembly of all Series 90-30 modules can be removed or installed from the module as described below. Terminal Assembly Removal 1. Open the hinged cover on the front of the module. 2. There is a jacking lever above the wiring terminals, on the left. Push this lever upward to release the terminal block. Series 90-30 PLC as a GCM module.